There are many types of decking available and you are often lost for choices. Now, trying to add kids into the equation, you will realise how few the options are left for you. Child safety is always something we parents worry about. Can they play in the decking comfortably? Can we play there without us worrying? Today, let’s take a look and explore why Eco Wood Composite Decking, one of the few safe decking options you would have, is recommended for family with kids! Splinter may seem to be nothing for us, as an adult. Yet, for kids, it may mean different thing. For toddler, they are still in the curiousity stage whereby anything to them seems to be food. They may try to chew on it, causing them to choke. Or otherwise, they may fall and hurt themselves. Having splinter in adult is painful, therefore needless to say for kids. As kids (not all) may not sit still, it makes it more difficult for adults to remove the splinter in them. Delay treatment may result in infection. Eco Wood Composite Decking will not have the above issues as it is splinter free. Hence, no more worries! Singapore weather is getting from bad to worst, with the highest temperature hitting to 36 degree celcius (our highest temperature ever recorded). You can imagine how hot the decking can be if it has poor heat resistance like most low quality composite decking products. Imagine having your kids running on the decking without the shoe. Ouch. That will be painful. How can kids enjoy their time then? With high heat resistance in Eco Wood Composite Decking, your child can step on a comfortable decking and enjoy the play time or play dates with you. Having an alfresco party at your rooftop, balcony or pool decking and worried about spills and stains on the decking causing by the children running about? Syrup drink, can leave a stain on the decking, destroying your current decking design. Moreover, would you prefer to have more time to spend on your little ones than cleaning your decking? You need to find one that is easy to maintain, so that you can get your wish! Eco Wood Composite Decking will not have these issue as it is easy to maintained on a regular basis. You will need splashes of water and it will be clean as before. Comfortable house, comfortable decking, happy owner. How about a eco friendly decking too? Now, you can have an eco friendly decking that assures not just safety but healthy homes. This is because good quality decking like eco wood composite decking ensures good air quality and non-harmful materials. 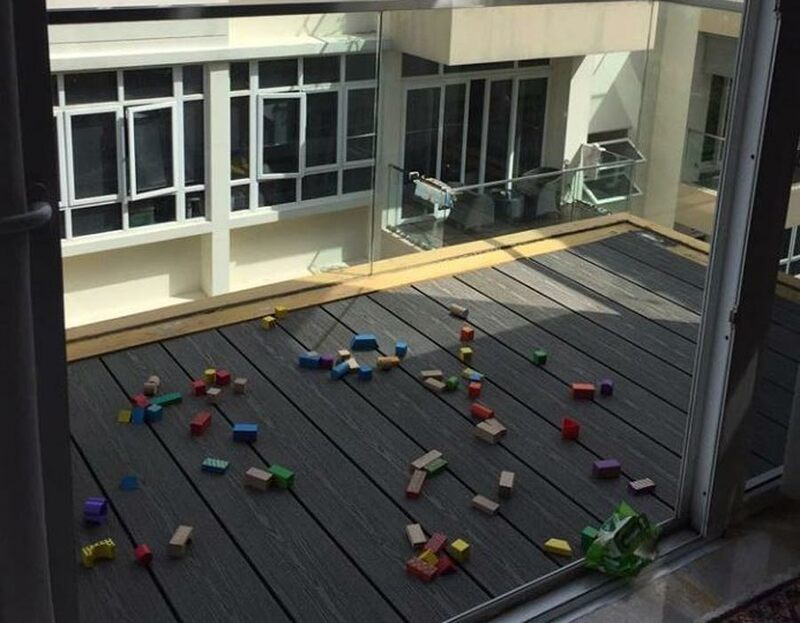 So, there you have the four factors of a kid-friendly decking. Enjoy shopping for decking with your children!